Daredevil Fan-Fiction: Why Did Matt Murdock’s Mother Leave His Father? I will start with an introduction, to set the context of this story. In the issue of Superior Iron Man shown above (#4, published in 2015), Tony Stark, also known as Iron Man (having had a “moral inversion,” or good/evil reversal), is the villain of the story, while Matt Murdock, also known as Daredevil, is the hero. It isn’t a typical comic book, for, in this story, the bad guy wins. 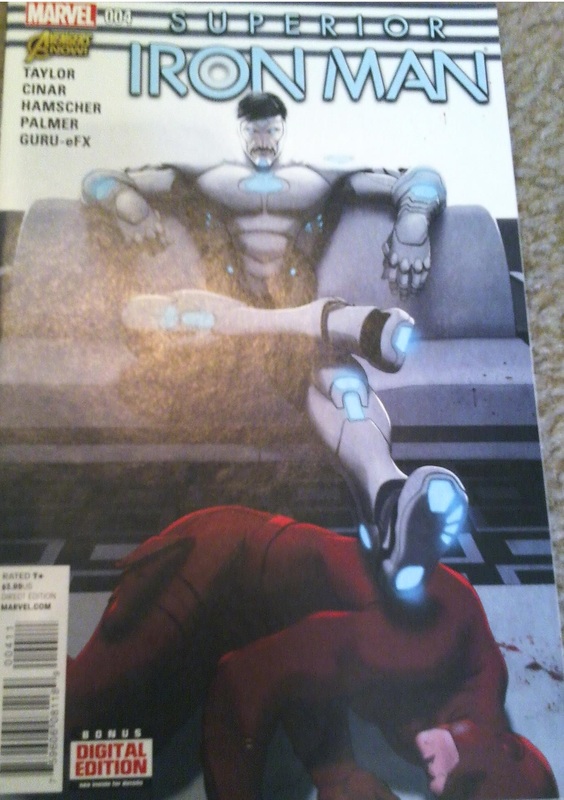 Stark uses advanced technology to overpower Murdock, and then this happens, near the end of the issue. 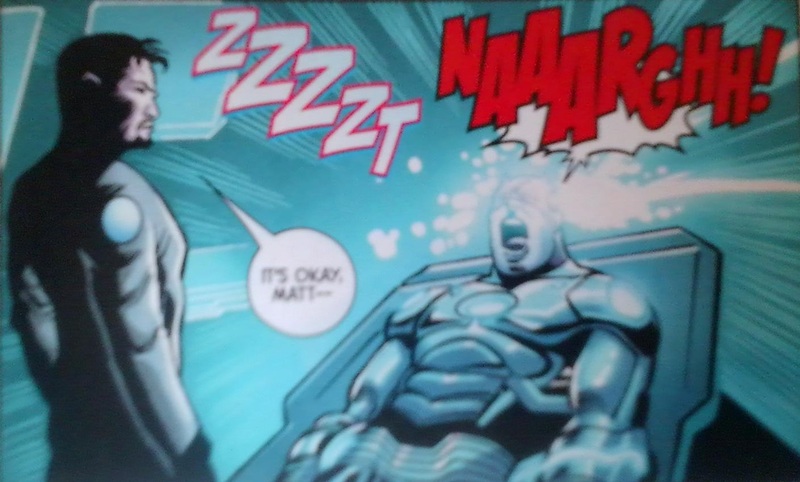 In the next panel, Matt wakes up, in a hospital, with no memories of the conflict with Stark. It is important to note that, earlier in this multi-issue story, which begins in Superior Iron Man #1, Stark restores Murdock’s ability to see. Realizing that the price of this is far too high, Murdock deliberately shuns this “gift” from Stark, and voluntarily allows his blindness to return. Now that the stage is set, on to the fan-fiction, which takes place, mostly, in the mind of Matthew Murdock, who is also an attorney, in-between the two panels shown above. Matt Murdock was blinded in a childhood accident, so he is used to darkness — but the darkness now enveloping him is far emptier than usual. His enhanced senses are gone. Hearing nothing, smelling nothing, tasting nothing, feeling nothing, and his “radar-sense” gone, he is now blind — really blind. Deprived of all sensory input, he also has no idea what is going on. However, he can think, and can also remember. The first thing he remembers is a single name: STARK! A jar of peanut butter? Why did the images freeze at this spot? What’s going on? Did I see this in a store? Did I see it in my home? Where did I . . . ? Daredevil is popularly-known as “The Man Without Fear,” but he’s always known that this description is inaccurate. For example, he fears the possibility of those he loves getting injured, or killed, by any of his numerous enemies, because of his exploits as a costumed hero — for that has already happened to him, more than once. He also realizes that he fears something else, but only if he sees it: peanut butter. Peanut butter? Why that, of all things? An earlier, strongly-repressed, memory then surfaces, and a great many things fall painfully into place for Matthew Murdock. Oh, no . . . anything but this . . . . He is no longer seeing recalled memories from a few days ago, but from early childhood — before the accident that blinded him. He was very young, had a bad head cold, and could smell nothing, explaining why the smell of peanut butter never triggered this memory before. Young Matthew looks around. He sees the kitchen of his childhood home. His parents, Jack and Margaret Murdock, are still together. He is wearing the clothes of a toddler, because that is what he was at this time. He’s on top of a counter in the kitchen, having climbed up there, using chairs to make a crude “staircase.” And there, on the floor, is a five-pound jar of peanut butter, surrounded by shards of broken glass. Matt, as a toddler, had only been looking for some cookies. He had not meant to knock his father’s gigantic glass jar of peanut butter off the counter, but the deed was done. The jar was broken, and could not be unbroken. There was broken glass in the peanut butter now; it could not safely be eaten. His family didn’t have much money, for his father’s career as a professional boxer was going nowhere, and his mother only made a little money, at the elementary school down the street, working as a substitute teacher. “Battlin’ Jack” Murdock, whom the adult Matt Murdock had idolized for years, was eating as much peanut butter as he could, simply to gain weight, and protein, in the hopes that this would, somehow, make him a better boxer. The crash of the glass jar hitting the floor echoed throughout the family’s small Hell’s Kitchen apartment. With his earliest memories now unlocked, he knew what was coming next. Matt tried desperately to stop the memory-playback. He failed, and his mind filled with fear. Loud footsteps . . . Dad? No! Please, please don’t . . . I don’t need to see this happen again . . . not again . . . . never again . . . .
“MATT!” His father had just burst into the room, having heard the crash. He saw the broken jar of peanut butter on the floor. His son started to cry, afraid of what he knew, in hindsight, was about to happen. “You clumsy little %$#@! Do you have any idea how much that jar COST me?” An incoherent, deep-voiced, roar of rage followed — and the noise from his father seemed louder than anything the adult Murdock had ever heard, even from his arch-enemy, Wilson Fisk, the Kingpin of Crime, and even with his enhanced senses taken into account. And, with that, the enraged “Battlin’ Jack” Murdock grabbed his only son, by both shoulders, with his son facing him, and started shaking him as hard as he could. Young Matt’s head flopped back and forth, rapidly, just like a worn-out rag doll. Matt heard a sharp “crack!” sound from one of the bones in his neck. The shaking continued. The adult Matt Murdock then remembered a legal case he had refused to take, over ten years earlier, defending a man who was then put on trial for murdering his son via shaken baby syndrome, which can kill children up to the age of three. Later, he learned the man had not only been convicted, but eventually put to death — the last legal execution in the state of New York, for killing his 2½-year-old son . He remembered smiling when he learned of this, but had not known, at the time, why this news had made him happy. Now, all at once, he knew. Luckily for Matt, the toddler, help was on the way. School had been dismissed, and his mother, Margaret Murdock, was just arriving home. She walked in on the most horrible scene she had ever witnessed: her husband attacking their only child. She didn’t hesitate, and had, fortunately for her young son, entered the apartment unseen by “Battlin’ Jack.” She ran at her husband, a trained boxer, jumped onto his back, and began clawing at her husband’s face with every ounce of strength she could find, screaming as she did so. Not only that, but it worked — she saved her son’s life. “You rotten little %$#@*! This is all YOUR fault!” She had saved Matt, but only by getting her husband to redirect his fury at the only other target available — herself. This was not the first time Jack Murdock had beaten his wife, but it was the worst beating she ever took from him, and it was also the last such beating. This was the last time Matt Murdock ever saw his mother — and, until many years later, as an adult, this was also the last time Matt heard her voice. Unknown to her son, or her monster of a husband, she escaped, to a shelter for battered women at a nearby church, but was unable to take young Matthew with her — her husband changed the locks after she left, and she was not able to gain access to him, in order to rescue him. She did, however, make contact with a friend who worked with New York’s Child Protective Services agency, and begged her friend for her help. She was (incorrectly, she later found out) told that, with no hard evidence available, there was no point in calling the police: an arrest of Jack Murdock would be, she was informed, impossible. However, she did convince her friend to have CPS keep an eye on the situation, for years, in order to ensure her son’s safety. The toddler Matt, of course, knew none of this. In fact, even as an adult, he never did find out about the CPS-monitoring which his mother had arranged, for his protection. As his mother was savagely beaten, young Matt laid limp, on the floor, his neck forming a very odd-looking angle, as the result of the trauma he had suffered. He could not move, nor could he speak, for he was in shock for over an hour. He could, however, see and hear. He heard his mother crying, and screaming, as her husband continued to beat her. He saw two of his mother’s bloody teeth fly across his field of vision. He heard some of her bones break, but could not turn his head to see which ones the monster of their lives had broken. He saw a calendar on the wall, and his adult self did the math, and figured out how old he had been when this happened: two and a half years old. This was now Matt Murdock’s earliest memory — but not for long. The weapon Tony Stark had designed, built, and used against him was programmed to seek out (and record) a person’s most traumatic, but still repressed, memory, and then force them to relive it, vividly, and, next, allow that person to suppress the memory once again — and then keep going, wiping out all memories for several days before the device was activated. 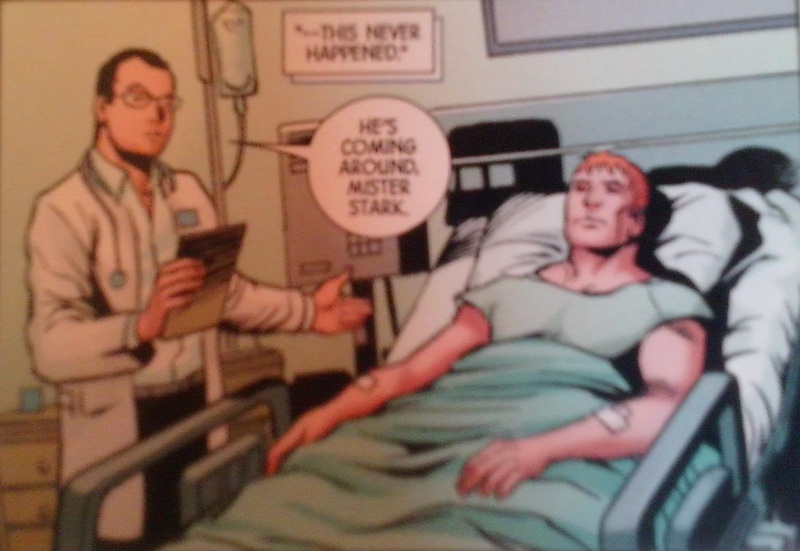 When Matt Murdock awoke in the hospital, he remembered nothing about either the conflict with Stark, or with his father. However, Tony Stark examined the recorded data about Murdock’s childhood, and filed it away, in case he ever decides to use it. And, of course, Matt Murdock’s earliest memory is not gone, but merely repressed. If Stark’s technology ever fails, which is certainly possible, these memories could always come back. 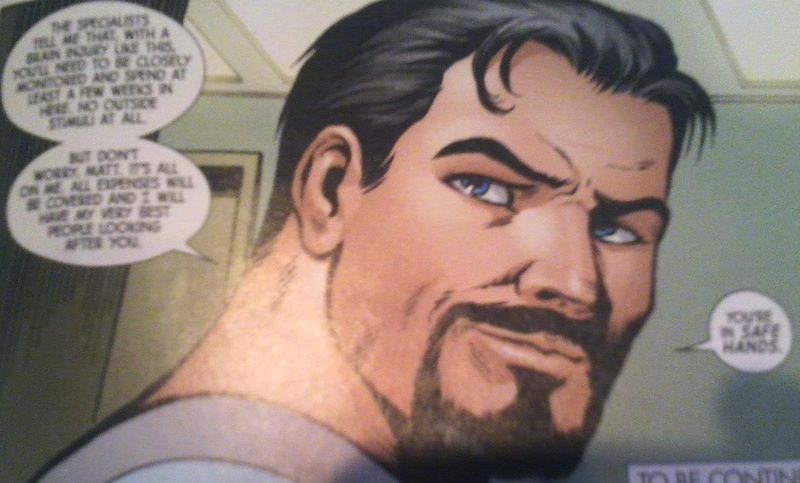 Tony Stark now understands Matt Murdock’s prime motivation for putting on a devil costume (despite the fact that he is Catholic), going out almost every night, and selectively beating only those people who seriously deserve to be beaten, and Stark enjoys knowing that he is the only person in the world with this information, to use however he sees fit, at any time. 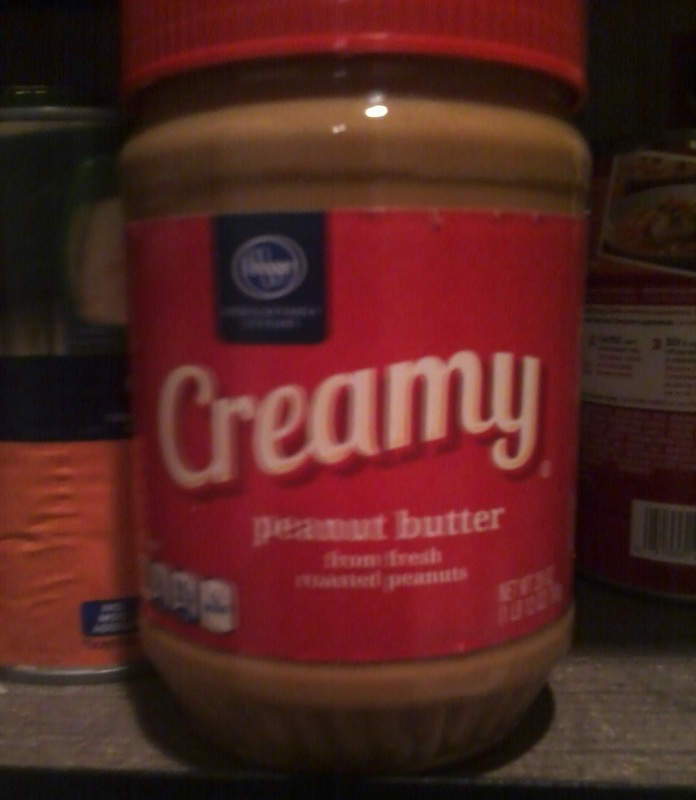 I took the picture of the jar of peanut butter myself. All other images in this post are from Superior Iron Man #4, published by Marvel Comics, written by Tom Taylor, penciled by Yildiray Cinar, and with cover art created by Mike Choi. For other credits, I refer you to this comic book. The “fuzziness” of the comic book images is deliberate, and done with the intent of avoiding copyright infringement, while leaving the dialogue readable. While writing this short story, I made every effort to keep it consistent with the decades-long story of Matt Murdock / Daredevil, a work which has involved dozens of talented people. Without their work to build on, I could not have written this story. The information in this story regarding Shaken Baby Syndrome is factual, as of the date of publication. A search of medical sources with Google will reveal that it does kill large numbers of babies, as well as children up to age three. Everyone needs to know this: shaking can kill babies and children. In this story, Matt Murdock survived. In real life, the author of this story survived; it is my earliest clear memory. Not everyone lives: 25% of us die, and of those who survive, 80% have to deal with permanent damage. Obviously, I’m among those who survived, but I’m also among the 80% of survivors with permanent damage. PTSD doesn’t just “wear off” once you get it, either . . . or at least, I haven’t found a cure for mine yet. This entry was posted in Fiction, Life, Mental Health and tagged abuse, child, childhood, comic book, comics, Daredevil, fan fiction, fan-fic, fanfic, father, Fiction, Iron Man, Marvel, Matt Murdock, memory, mother, repressed, repression, shaken baby syndrome, short story, story, suppressed, Tony Stark, trauma, violence by RobertLovesPi. Bookmark the permalink.